Amazon.com description: Product Description: The Horror issue features original cover artwork by Jake and Dinos Chapman and a line-up of contributors that includes some of the greatest names in contemporary fiction.Stephen King tells the story of a retired judge with a deadly secret. Don DeLillo imagines a moviegoer-turned-stalker and Paul Auster writes of his mother's death. Rajesh Parameswaran dips into the mind of a tiger who escapes from a zoo and terrorizes a neighbourhood. Will Self writes of his blood disease and Daniel Alarcon explores the phenomenon of staged, high-camp blood baths. Mark Doty ruminates on a close encounter between Walt Whitman and Bram Stoker. CONTRIBUTORS: Daniel Alarcon, Paul Auster, Tom Bamforth, Roberto Bolano, Don DeLillo, Mark Doty, Sarah Hall, Stephen King, Kanitta Meechubot (artist), Julie Ostuka, D.A. Powell (poem), Rajesh Parameswaran, Santiago Roncagliolo, Will Self, Joy Williams. 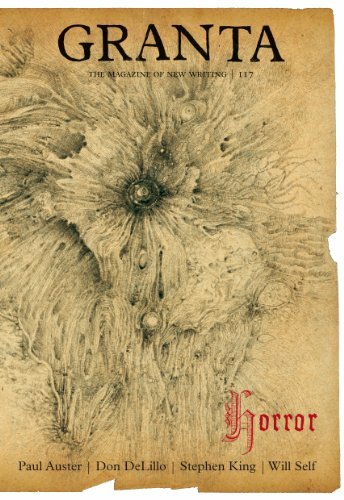 About: The Horror issue features original cover artwork by Jake and Dinos Chapman and a line-up of contributors that includes some of the greatest names in contemporary fiction.